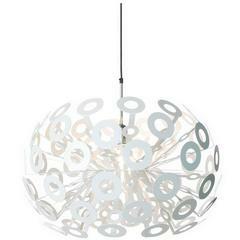 Suspension lamp with diffused and direct light. Diffuser consisting of 6 rings of various diameters and shapes with an oblique cut, made of matt finish injection molded polycarbonate, secured to the epoxy powder coated metal internal frame using 3 small stainless steel wires. Ceiling rose with galvanized metal bracket and glossy white batch-dyed ABS cover. Three stainless steel suspension cables and a transparent electrical cable. Canopy decentralization kit available. Materials: Varnished injection molded polycarbonate and Varnished metal. Light source: LED 46W. Color: White.